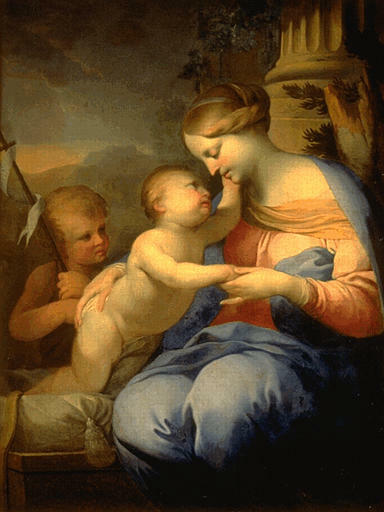 ^ Born on 12 July 1666: Antonio Balestra, Italian painter and printmaker who died on 21 April 1740. — His altarpieces and history paintings, which unite late Baroque classicism with Venetian color, brought new life to north Italian painting. The son of Lucia Boschetti and Francesco Balestra, a wealthy merchant, he studied literature, rhetoric and the humanities, but, after lessons in drawing and perspective with Giovanni Zeffis [–1688] and one Monsignor Bianchini [1646�1724], he moved to Venice in 1687 and trained with Antonio Bellucci. In 1691 he transferred to Rome, where he studied under Carlo Maratta [1625-1713], whose art continued a classical tradition that can be traced back to Raphael [1483-1520], and where he also absorbed the work of Annibale Carracci [03 Nov 1560 – 15 Jul 1609] and Domenichino [21 Oct 1581 – 06 Apr 1641]. In 1694 Balestra�s large drawing of The Fall of the Giants won first prize in a competition at the Accademia di S. Luca. In 1695 he returned to Verona, where he was acclaimed as the chief exponent in the Veneto of Maratti�s late Baroque classicism. 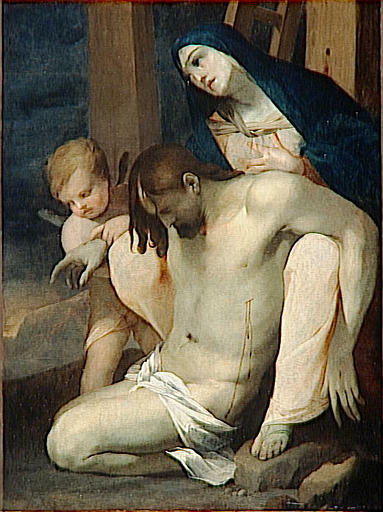 His pictures of this period were mainly small religious works, such as the Agony in the Garden. Mattia Bortoloni was a student of Balestra. 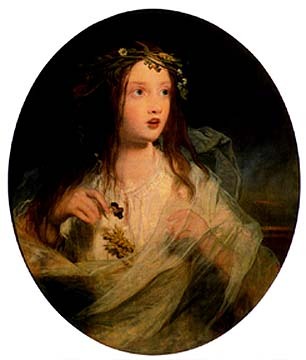 ^ Died on 12 July 1916: James Sant, English painter born on 23 April 1820. — He studied under John Varley and Sir Augustus Wall Callcott and at the Royal Academy Schools, London. He was elected ARA in 1861 and RA in 1869. In 1872 (1871?) he became portrait painter to Queen Victoria, whose portrait he painted with three of her grandchildren. He exhibited regularly at the Royal Academy from 1840, retiring in 1914. He was a prolific and successful portrait painter who often created striking effects of pose, tone and color, with vigorous handling. At the end of the 19th century he adopted a freer style, influenced by John Singer Sargent. He also painted landscapes, allegories and genre scenes and worked in watercolor as well as oil. Such sentimental subjects as Little Red Riding Hood (1860) were immensely popular in reproduction. The London-based landscape painter George Sant (fl 1856�1877) was evidently his brother, for whose works James often provided the figures. — James Sant was primarily a painter of portraits, and from 1872 was officially portrait painter to Queen Victoria. He had many other patrons amongst the aristocratic families of Britain, hence he must have been a painter entrepreneur. Sant's portraits of noble ladies were flattering, something they, and their husbands unsurprisingly liked. He also painted allegorical and genre pictures. Rather surprisingly Sant was known to be very straightforward with sitters who applied what he considered to be too much make-up. He started exhibiting at the Royal Academy in 1840, and showed his last picture in 1915. — Ophelia (64x76cm) _ This half-length Ophelia looks more like a child than a woman capable of the attentions of the thirty-year-old Hamlet. Ophelia, wreathed in flowers and holding a pansy ("that's for thoughts"), is more puzzled — even vacant — than mad. Sant's keep-sake portrait is clearly aligned with the tradition of a young, vulnerable, and delicate Ophelia.  One of the first French landscape painters to paint in the open air, directly from nature. His numerous beach scenes form a direct link between the carefully observed Naturalism of the early 19th century and the brilliant light and fluid brushwork of late 19th-century Impressionism. — The son of a mariner, Boudin served as a cabin boy on his father�s coastal vessel and thus became familiar with the moods and atmosphere of the sea, which, with the Normandy grazing lands, was his main subject-matter. After a year of schooling in Le Havre in 1835, Boudin worked with a local printer and then with a stationer and framer who displayed paintings by visiting artists; thus he became acquainted with Th�odule Ribot, Thomas Couture, and Jean-Fran�ois Millet, as well as Constant Troyon and Eug�ne Isabey, who were important influences. He also studied under Daubigny. By 1844 he had set up his own stationery business from which he withdrew in 1846 after spending all his money on buying a conscription substitute. In 1847 he decided to become a professional painter and went to Paris, where he was stimulated by the landscapes, marines and still-lifes of the 17th-century Dutch school and contemporary Barbizon paintings. He copied Old Masters, some of which he did for Baron Isidore-Justin-S�verin Taylor, who subsidized Boudin�s travel in northern France and Belgium in 1849. In 1851 Boudin was granted a three-year scholarship by Le Havre Municipal Council to work in Paris, Rouen and Caen, as well as locally. In 1854 he made wider contacts with the group of artists who frequented the Ferme Saint-Sim�on, near Honfleur. His visit in 1855 to Quimper aroused an interest in local costume (e.g. Breton Festival); a second, extended Breton tour in 1857 enamored him of the landscape and yielded an important sequence of monochrome drawings reflecting Barbizon influences. At an exhibition of the Soci�t� des Amis des Arts du Havre in 1858, Boudin met Claude Monet to whom he offered substantial encouragement, stressing particularly the primacy of working directly from nature. In 1859 Boudin�s Pardon de Sainte-Anne-la-Palud (1858) was accepted at the Paris Salon, where it was praised by Charles Baudelaire. In the same year Boudin befriended Gustave Courbet, the style of whose largely studio-painted sea and sky pictures he raised to a new pitch of naturalism.  Born into a seafaring family, Eug�ne Boudin is mostly known for his paintings of sea and sky. Although often described as 'the painter of beaches', the beach itself in his painting [The Coast of Portrieux] only occupies a portion of the canvas and it is the large, luminous sky that predominates in the work. Boudin worked directly from nature on the Normandy coast and in particular at the fashionable resorts of Deauville and Trouville. His seascapes and beach scenes were painted at many different times of the year and in a variety of changing weather conditions. Boudin introduced Claude Monet to this method of painting outdoors, thus Monet painted The Beach at Trouville several years later. Boudin's overriding concern was light, and in his dabs of pure color and loose and delicate brushwork, he prefigured Impressionism, marking the link between Corot and the Impressionists. Indicative of the esteem in which he was held by the Impressionists, Boudin was included in their first exhibition in 1874.  Eug�ne-Louis Boudin, French painter, was born in Honfleur, the son of a harbor pilot. In 1835, he settled in Le Havre, where he was apprenticed to a printer. In 1838, he started to work in an art supplies store and drew in his spare time. Paintings by Couture, Millet, Troyon and other artists who visited the city were exhibited in the store. They gave young Boudin valuable help and advice. Soon he gave up the store, to dedicate himself wholeheartedly to painting. 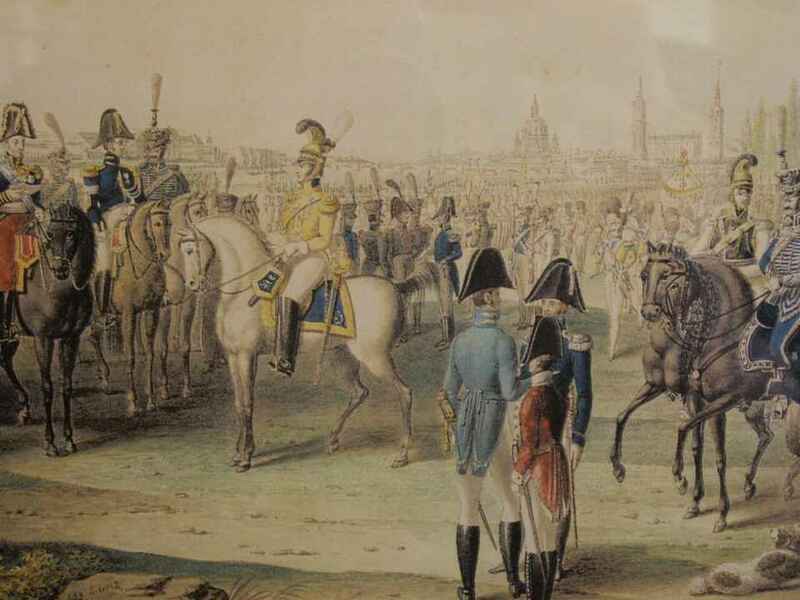 In 1847-48, he traveled to Paris, visited northern France. In 1850, he exhibited two pictures in Le Havre, after which the town granted him a three-year scholarship to study in Paris (1851-1853). Boudin first exhibited at the 1859 Salon and then at the 1863 Salon des Refus�s. After his return to Le Havre he spent many summers on the farm of Saint Sim�on, in the environs of Honfleur. He traveled widely in Normandy and Brittany, and visited Holland, Belgium and Venice. Wherever he went, he invariably painted harbor and beach scenes. In the 1850s, Boudin met Claude Monet and did much to help the young painter find his true artistic self. In the 1860s he frequently saw Edouard Manet and worked with him in Boulogne and Deauville. In the 1870s, the Impressionists, in their turn, began to exert an influence on Boudin. His land- and seascapes of that period are filled with a constantly changing iridescent light; his palette grows lighter and the brushstrokes assume the aspect of soft, blurred patches of color. In 1874, Boudin took part in the 1st Impressionist Exhibition. He also frequently exhibited with the Impressionists later. His pictures of the sea made him one of the precursors of the Impressionists. — Vacationers on the Beach at Trouville (1864, 67x104cm; 710x1123pix, 535kb _ ZOOM to 1609x2545pix, 2713kb) about 10% crowded vacationers, 10% beach, and 80% cloudy sky. –- La Plage de Trouville (1879, 16x34cm; 517x968pix, 74kb) heavy brown dis(? )coloration all over. ^ Died on 12 (11?) July 1663: Lubin Baugin, French painter born in 1612 or 1613, specialized in Religious Subjects.  Baugin was active in Paris. 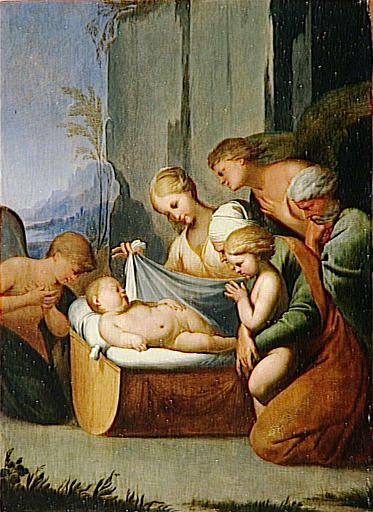 He painted religious works and has earned the nickname "Le Petit Guide" because he was strongly influenced by Guido Reni. This suggests that he visited Italy, but there is no firm evidence. 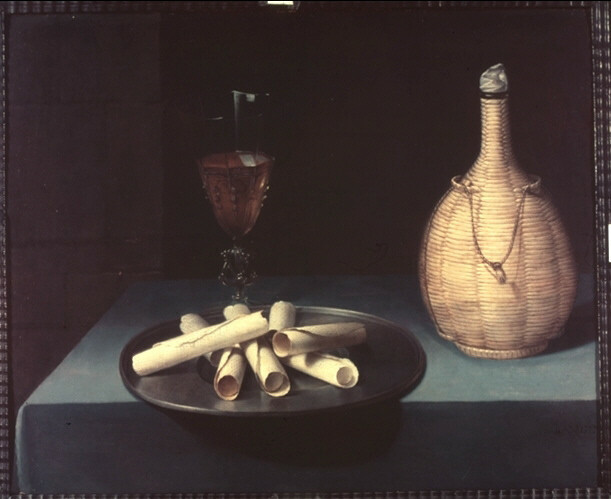 A small group of strikingly austere still-lifes, signed simply "Baugin", has also been attributed to him, although there is little in common between these pictures and the religious works. — He became a master in the painters� guild of Saint-Germain-des-Pr�s in 1629. From 1636 he was in Italy, but he is known to have been in Paris again in 1641; in 1645 he became a member of the Acad�mie de Saint Luc, and in 1651 he was also a member of the Acad�mie Royale after the temporary amalgamation of the two institutions. Like many of his generation he was deeply influenced by the art of the Fontainebleau school. The Mannerist tendency of his style � its elegant elongations of bodies, its self-consciously graceful poses, its bracing, slightly acidic coloring and the curving rhythms of his compositions � must have been confirmed by his contact in Italy with the painting of Parmigianino, Correggio and Barocci. His works also show the influence of the art of Raphael and of such Bolognese painters as Guido Reni, and he acquired the nickname �le petit Guide�. He did some work for the Parisian tapestry factories, and he was one of the artists working on tapestry cartoons in association with Simon Vouet. 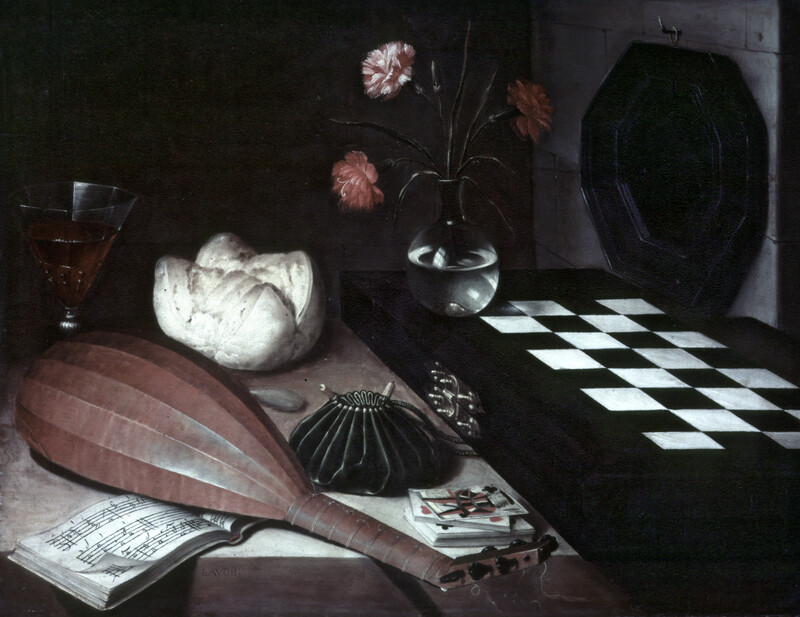  Nature Morte à l'Échiquier aka Les Cinq Sens (1630, 55x73cm; _ ZOOM) _ In this picture the archaic arrangement of objects seems rather meager compared with Dutch still-lifes at that time. Baugin's paintings are dominated by aesthetic elements that reflect a strict Calvinist morality. 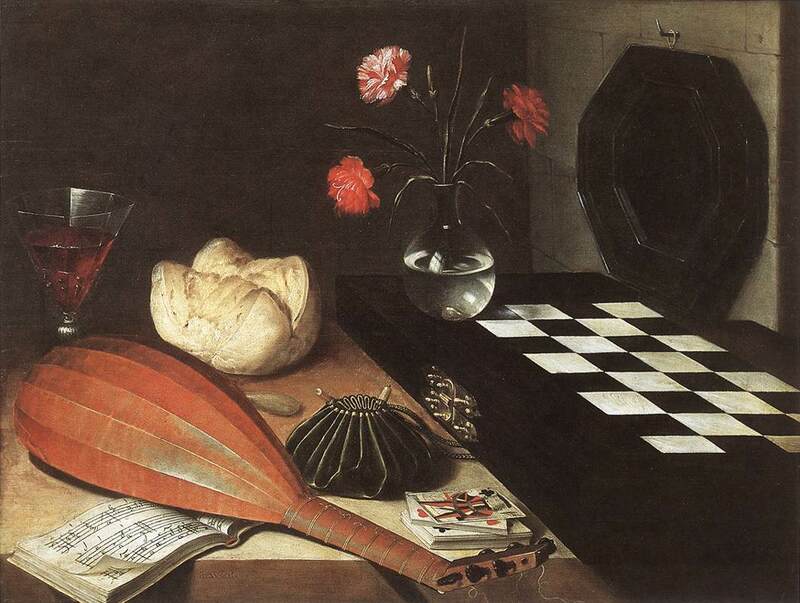 The symbolic props have been placed very economically: a dark mirror represents sight, a bunch of carnations in a vase - smell, bread and wine - taste, a chessboard in a closed box - touch, and finally the vermilion mandolin - hearing. These are not far from a game of cards (with a Jack of Spades on top) and a tied-up purse. 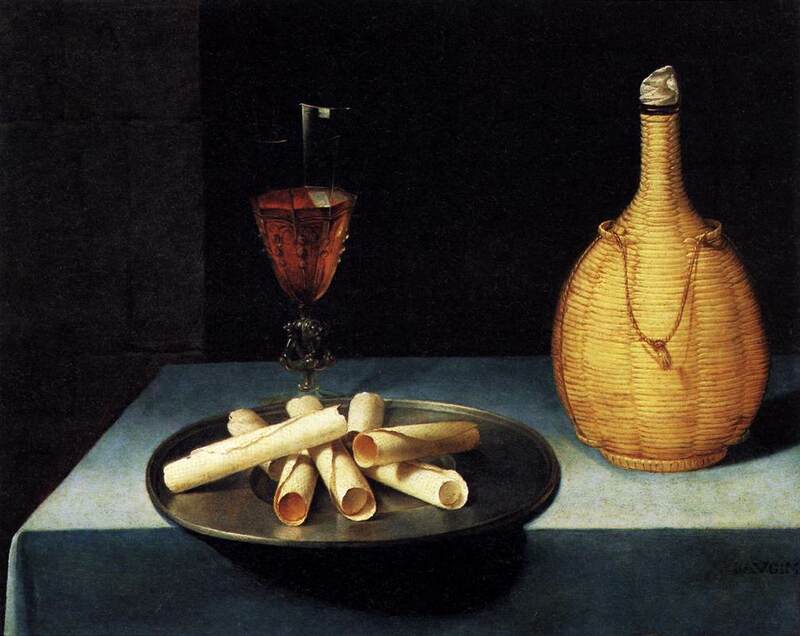 Similar to 'Merry Society' type of paintings, music is regarded as morally corrupt and in opposition to the eucharistic symbols of bread and wine.  Le Dessert de Gaufrettes (1635, 41x52cm; _ ZOOM) _ There is unlikely to be a specific moral in this still-life, which seems to be simply an exercise in accurate observation. ^ >Born on 12 July 1917: Andrew Wyeth, US Contemporary Realist painter who died on 16 January 2009. Son of Newell Converse Wyeth [1882 – 19 Oct 1945], father of Jamie Wyeth, brother of Henriette Wyeth.  As Andrew Wyeth became as much a celebrity as Henry Fonda (who admires and imitates his work), his reputation as an artist declined to the point where writing about him was an eccentricity requiring explanation. For most of us, his stardom has cannibalized his art to a degree unprecedented by any other artist with pretensions to seriousness. Informed opinion, when it thinks about the matter at all, has removed his art from its genteel inheritance of Eakins and Homer, and relegated it to the company of such an amiable mythmonger as Norman Rockwell. Not all this is due to disenchantment with the art itself. Wyeth's prices have been engineered to extraordinary heights. Reproductions have saturated our tolerance but not the market. Every aspect of his life has been endlessly celebrated and whatever he has to say has been written down and turned into best sellers. Perhaps this is nothing more than the media testing his commercial viability, as they do with every successful artist. That viability depends on what public expectations the artist can confirm. Wyeth's success, within which he apparently resides easily enough, arouses in the "genuine" artist a contempt that is obligatory if he is to maintain his intellectual respectability. The artist-hero is expected to be so troubled by his success that he reinforces his myth by rejecting it-thus raging, as it were, against the bars in that zoo to which US society generally relegates its cultural activities. Success cuts off careers in the US for a very sharp reason. It makes the artist part of what he has based his art on rejecting: the values of the majority and the commercial engines supporting them. The divided mind and the aborted career usually have been attributed to the crassness of US society or some such easily apprehended generality. More acutely felt by the successful artist or writer, however, may be the closing of the ranks among his colleagues, and an exclusion, prompted by envy and intolerance, that amounts almost to an expulsion. While some US writers have exhibited an appetite for the sillier aspects of superstardom, or have been ill-equipped to deflect it, we have underestimated the attrition caused, not just by the public, but by colleagues. To succeed in the US may demand more toughness of spirit than to fail. Few manage to have careers both successful and long. If Wyeth is an industry, who are the consumers? In those precincts where the products of the Picasso industry are de rigueur, Wyeth incunabula are something of a social liability. Those who share Wyeth share values we can identify with some confidence. For the members of this community-it is nothing less-the concept of "nature" is still a living force. Admiring stability and order, they are suspicious of the new, distrusting unorthodoxy but not eccentricity. Subscribing to a belief in human goodness, they can be dangerous when that belief is threatened. Along with nature, religion and morality are real forces in their lives, and a great deal of their energy is devoted to sustaining all three as values which should monitor the evolution of the social order. They maintain a firm belief in the future, and this optimism is as powerful a force in conserving their traditions as is the past. Evil tends to be rationalized as a failure to live by the letter of these beliefs, and so reinforces them. They are not unlike Wyeth himself. While the gap between the avant-garde and the public has accustomed us to amusing kinds of leap-frog and acculturation by myth, no such gap exists between Wyeth and his audience. Though his community's values appear to many to be, like Wyeth's visual conventions, obsolete, we must look for the energy sustaining an "obsolescence" that is taking such a long time to go away. The source of this energy is in the powerful resistance to change, in the fierce conservation of the values that give meaning to existence. In its stability Wyeth's audience could be called, no matter how sophisticated its members, primitive. It shares superstitions, beliefs, icons, a circumscribed worldview, and ritualized modes of releasing violence. It is in fact a primitive community within, or side by side with, a progressive-destructive one, and appropriately it is served by an artist who, no matter how sophisticated his means, is primitive in his thinking. Wyeth's communication with this audience is so instantaneous that it makes the McLuhanesque idea of viaticum via media seem a little forced. Wyeth's art, then, functions socially in a way that both avant-garde art and Russian realism might envy. At the Wyeth retrospective at the Whitney Museum in 1968, one of the sights was not the art, but the audience entering the museum with the same settled expectancy as crowds about to view Lenin's tomb. Watching the members of that audience communicate with the pictures and with each other, it was obvious they were rehearsing the values by which their lives were lived. In this context, the individual works of art became icons for a way of life. Insofar as they assemble the parables of the faith, Wyeth books assume a certain sanctified character in the homes of this audience. At the root of this is a nineteenth-century idea of nature as a moral force, identified with nationalism, and providing a Holy Book, as Barbara Novak has called it, for meditation and interpretation. This ideology, implicit rather than explicit in Wyeth's art, is what provokes such hostility from the aesthetically sophisticated audience, in exactly the same way his audience responds to avant-gardism. So Wyeth communicates with his audience, numbered in millions, with an ease and fluency that amounts to a kind of genius. Sharing their beliefs, he is able to inflect them endlessly by giving the audience, like Billy Graham, a sense of community and individuality, stimulating a buried imaginative life while leaving the surface undisturbed. By fulfilling a communal need while being faithful to his own interests (in a context of shared beliefs), Wyeth's voice and myth echo each other in a way unknown in modernism. Truth to experience is the audience's criterion, checked by reference to nature, and if the experience itself is banal it remains undisturbed by the art. What the audience sees is not process or formal deftness, but an image, all at once. In this sense, modernism's increasing narcissism with respect to its own means measures the break-up of a community and the rising arc of the artist's alienation. Wyeth and his stable community, sophisticated primitives sharing their transcendental populism, arouse prejudices rooted in a conflict underlying more obvious skirmishes-the conflict between two ways of life, the rural and the urban. Modernist art is urban art and it has incorporated the pastoral idea in various disguises, often hiding in its abstract facade a nostalgia for landscape. In modernism the landscape has been painted by urban creatures knowing nothing about it or the rural life. Impressionist landscapes are as neutral as Cubism's guitars. Nature becomes a perceptual laboratory in which light and color disengage themselves from representation to become the chief actors. The landscape, even Expressionist landscape into which violent emotion is projected - is drained of its violence. The Darwinian struggle is transferred from the landscape to the city, and this transposal of the rural mythology is an unexplored part of the urban mind. That mind, however, while it accepts the urban view of the landscape (from Fairfield Porter's sunny idealizations to Hopper's bald realism), will not accept the rural view-nor is it equipped to read it, or perceive in it anything more than clich�s identified with forms of nationalism troubling to the liberal spirit. Thus Wyeth, the only genuine rural artist of the slightest consequence, is attacked with a violence far beyond the usual etiquette of critical disagreement. The hatred of Wyeth in informed circles is matched only by his audience's identification of abstraction with communism. For this reason we can couple two artists who epitomize urban and rural mythologies  Warhol and Wyeth. The two Andys, though separated by a Grand Canyon of irony, traffic in great images rather than paintings, Both tell more about the urban and rural milieus than any other US artists. Both arouse a violent prejudice aborting them out of art history into social history and legend. Both, totally obtuse, share mirror-image varieties of innocence: Wyeth is a sophisticated primitive; Warhol, like Jarry, a primitive sophisticate. Wyeth has inherited in his oblivious way a nineteenth-century apparatus that one need not trace further than Constable in painting, Coleridge in literature, transcendentalism in philosophy, and the einf�hlung of Theodor Lipps in aesthetics. Nature attitudes, of course, have become a shrunken repertory of clich�s. Wyeth uses them as if he had never heard they were clich�s, and thus - in a way different from, but almost as effective as, ironic quotation - he forces us to acknowledge the truth they inter. Very offensive to modernist sensibilities, this. Modernist art is placeless  a state of mind knowing no borders, communicating with ease through formalist Esperanto. Rural art is inseparable from place, and there is pathos as well as country cunning in Wyeth's devotion to two small reservations, Chadds Ford in Pennsylvania and Cushing in Maine. These reservations (surrounded by neon and superhighways) have an air of preservation that makes nature artificial, and Wyeth exists in a milieu as sealed in its way as a Cornell box. He is primitive and ideographic in a way unacceptable to those who dote on Grandma Moses; and at the same time a provincial-that is, one baffled by the idea of progress. Thus his art resists a development it appears sometimes to seek. The luxury of "periods" is denied it. This lack of progress, however, is a way of coping with the outside-urban-world that would destroy his raison d'être. Similarly, his rigid curatorship of the two areas that authenticate his work, and his fear of moving outside them. When the subject of realist art disappears, it becomes less understandable than the most rigorous abstraction. To judge Wyeth, then, in terms of progress, change, invention, self-consciousness, is to look for an artist who isn't there. The convictions to which he clings with naïve integrity keep him from engaging with the variousness of life, and his art tends to become a vehicle for rehearsing settled values. His skepticism shares in the qualities of village faith; his belief as to the unavoidability of loss becomes a simplistic inversion of Victorian optimism. The corroding ironies, the scathing assaults on untested convictions, the playfulness and deviousness of mind we have come to expect in modern art - these are not here at all-not here at all. In Wyeth can be seen a rural attitude and an awareness of a rural world under stress from outside. Wyeth emphasizes age, textures, and clear focus. He tinkers with animistic associations to bring home a description. In describing landscape, he moves from close-up to distance abruptly  and back. Traces of human and animal passage (roads, cart-tracks) frequently populate bare landscapes; and he returns to the country problem of recognizing the familiar disguised by light or distance. But Wyeth refuses the implications of total desolation by safely sticking a house, like a humanistic thumbtack, into the distance. Wyeth is an extremely sharp observer of rural characters. And under his surface optimism and sentiment, Wyeth's vision is not always settling. Wyeth is about the pursuit of strangeness. But he is not whole as Hopper is whole. Indeed, if one can accustom oneself to Wyeth's sentiment as a form of surface politeness, one can learn to read the sizable brutalities it hides: the casual insertion of deathly signs, the horror as well as the humor in country quirkiness, the panic in empty spaces that point attention to a kind of listening. One becomes sensitized to the scenarios behind open doors, cupboards, windows, simple objects. A pair of boots outside the door: Is he in or out? Has he been hunting? Any sign of dead game? No smoke from the chimney. Has he gone out again? Where's the dog? That silence. Hope nothing's wrong. Couldn't be. I'll leave a note. Is the door open? This kind of deductive fugue is a language in which country people are perfectly versed. The voice in their ears is their own. They are accustomed to reading people, objects, sky, and above all strangers, who do not realize that indifferent eyes conceal a hubbub of observation and conjecture, assisted by a silence that prompts the uneasy visitor to reveal more than his speech betrays. This is a proto-literary form that presents itself visually-and a closed book to urbanites. How closed is known to anyone who has tried to open it to city eyes. All the events in the country are flashes. The glimpse of red is missed; even when seen it is not recognized as a fox. Eventually the subliminal activities that he cannot see provoke in the inexperienced observer the idea that he is being watched, and this slight threat may sharpen his sight. What is most true about Wyeth's art is its fidelity to this way of looking, to this internal stream of deductive language country people listen to as they move around. (Indeed, Wyeth's art is a kind of record of that movement. Like country life it is full of the rhythms of walking, of perspectives changing slowly with approach and withdrawal, of sudden details switched into distance with a glance.) This rural voice in Wyeth's work is close to an actual voice, a mode of reading the landscape to oneself from the point of view of a dweller in it. Intimately connected to a way of life, this voice, when deprived of its referent, drops out of the picture, leaving clich6 behind. Thus Wyeth's audience is made up of city dwellers who like the clich�s, and country dwellers who read his pictures as they read nature and find them true. So if we speak of Wyeth's voice, it is not just the artist's personal discourse, but a kind of dialogue with objects and nature which his rural audience overhears and recognizes perfectly. At this point one begins to doubt if Wyeth is painting pictures, and in a way it hardly matters. For this voice is what makes Wyeth the only genuine rural artist in contemporary art; indeed, in the history of art there are very few. Ludicrous though it sounds, the only time one finds oneself listening to this kind of voice is on certain occasions when the Gothic imagination is clarified by Renaissance observation with Brueghel, for instance. Wyeth's innumerable followers, many of them infinitely more skilled than he, present the simulacrum of nature without the voice clich�s lovingly reinterred. Wyeth thus leads an army of dead men bent on repealing modernism,and restoring moral health through the trinity of nature, nationalism, and godliness. Wyeth, who shares their political views, is an outsider aligned on the right against the modernist conspiracy. The pursuit of strangeness is the key element in Wyeth's voice, the discourse between the observer and a situation that is a form of expectation. In the country such expectation encourages intense projections. Each extended sense monitors itself and the others. Seeing becomes a kind of listening. A smell can become a kind of hearing. Overactive in that country silence, one's senses crawl over and inhabit everything. Strings of association prompt hypotheses, and hypotheses test strings of associations. Identity is somehow translated into the landscape. One becomes all eyes and ears. Such animal-like empathy is also encouraged by what Wyeth chooses to paint: carefully assembled sounding boards for sensations both familiar and unfamiliar, or rather unfamiliar in a very familiar way. The tracks and traces cue the voice in the work, exciting those crackles and rustlings that, for anyone raised in the country, forcefully inhabit Wyeth's pictures, and indeed often stimulate him to paint them. Objects report on their experiences by showing wear and tear. Wyeth's objects clearly report on country usage, anthropomorphosed by repeated involvement in intimate living habits. Infused with the animism unavoidable from contact with nature, objects develop a physiognomy. When deprived of usage, such objects are defenseless against nostalgia (savoring the past all at once and without effort) and are, except for the most sophisticated kind of quotation, artistically unusable. Wyeth's reportage on textures and appearances, while part of country language, betrays his inability to grasp things though he describes them well. For instance, the beech tree in Corner of the Woods is simply a textured curtain behind the figure, remarkably similar to some US primitive paintings. It has no solidity at all. The great boulder in Far from Needham has no solidity either, but he has filled in on every dotted line the record of the object's history. He is the object's genealogist instead of its possessor. Though crawling with its past, it is not physically present. The ectoplasmic results can be read as the primitive's conceptual frustration of the provincial's effort to perceive solidity, a conflict that gives at least an interesting tension to such works. The object is situated halfway between solid existence and an ideograph, though that halfway state is disguised in highly sophisticated techniques, and this perilous condition can have a case made for it in, inevitably, literary terms. There is almost no space here; and you feel almost calm at the thought that it is impossible for anything very large to hold in this narrowness. Spirit is matter reduced to an extreme thinness. — Self-Portrait on 27 December 1963 Time cover. — Eisenhower (527x400pix, 208kb) 07 Sep 1959 Time cover. ^ Died on 12 July 1841: Georg Emanuel Opitz, Austrian portrait and miniature painter, watercolorist, and engraver, born in 1775 in Prague. Il fut l��l�ve de Casanova � Dresde et peignit d�abord des portraits � l�huile ou en miniature. 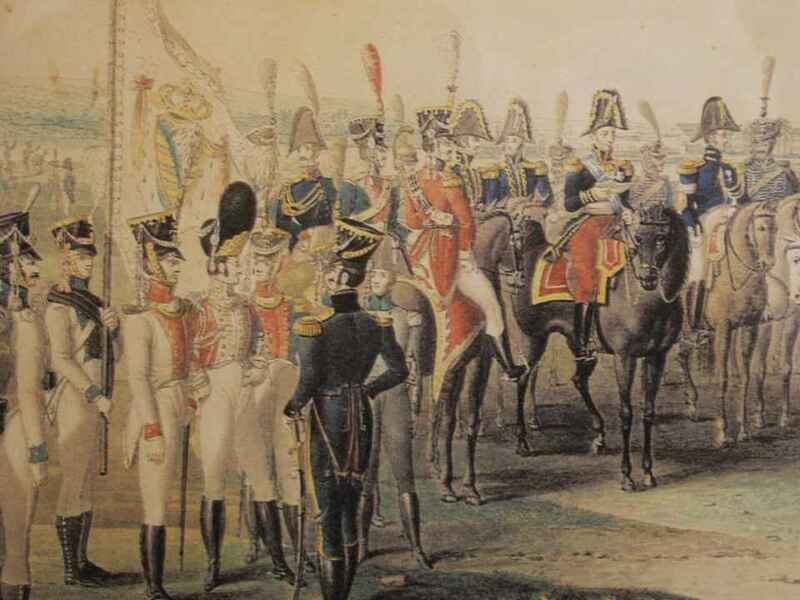 A partir de 1807, il se consacra avant tout � la repr�sentation de sc�nes populaires.  Dedication of a Synagogue in Alsace (1828, 66x93cm) attributed to Opitz _ The artist depicts the consecration of a synagogue as an event that involved the entire community. He has portrayed and caricatured both Jews and non-Jews. The rural architecture and hilly landscape are carefully rendered, but the exact location of the scene is unclear. The landscape, the women's headdresses, and the building style suggest western Alsace in the region of Bouxwiller. Jewish settlement in Alsace was first documented by the traveler Benjamin of Tudela in the early twelfth century. A province of Germany, Alsace was annexed by France in 1648. Jewish inhabitants of the region, however, continued to speak Yiddish-Deutsch, a Jewish-German dialect. Prior to the Revolution of 1789, the Jewish community of Alsace, numbering nearly 20'000, was the largest Jewish community in France. Dedication of a Synagogue in Alsace portrays the life of Jews in the countryside of Alsace-Lorraine, where Captain Dreyfus was born. The presence of two boys standing amid the crowd in the painting's lower left-hand corner give this nineteenth-century scene a human, accessible, and even humorous quality. School children in particular are always excited to discover this detail in the painting. — Die Limonadenh�tte am Graben (1830, 36x26cm; 491x385pix, 52kb) faded to monochrome. 1998 Serge Lemoyne [13 Jun 1941–], Quebec painter and performance artist. 1925 Lovis Corinth, German painter born (full coverage) on 21 July 1858. 1924 Henrietta Mary Ada Ward, London painter born on 01 June 1832, wife of Edward Matthew Ward [14 Jul 1816 – 15 Jan 1879]. She was the daughter of George Raphael Ward and the miniaturist Mary Webb (fl 1828�1849). An indulged only child, she was encouraged in her artistic talent and received instruction at home, supplemented by attendance at Henry Sass�s drawing school. She also had advice from her husband, whom she married in 1848 against her family�s wishes. She made her exhibition d�but at the Royal Academy in 1846 with the drawing Elizabeth Woodville Parting from the Duke of York. After her marriage Ward continued to attend Sass�s and also the Royal Academy Schools lectures, although they were officially closed to women. From 1850 she exhibited widely in Britain, though she sent her principal works to the Royal Academy throughout her career. She also exhibited at the Society of Female Artists, which was formed in 1857. 1913 Gaston de La Touche, French painter born (full coverage) on 29 October 1854. 1907 David Farquharson, British artist born in 1839 or 1840. 1904 Hendrik Dirk Kruseman van Elten, Dutch artist born on 14 November 1829. 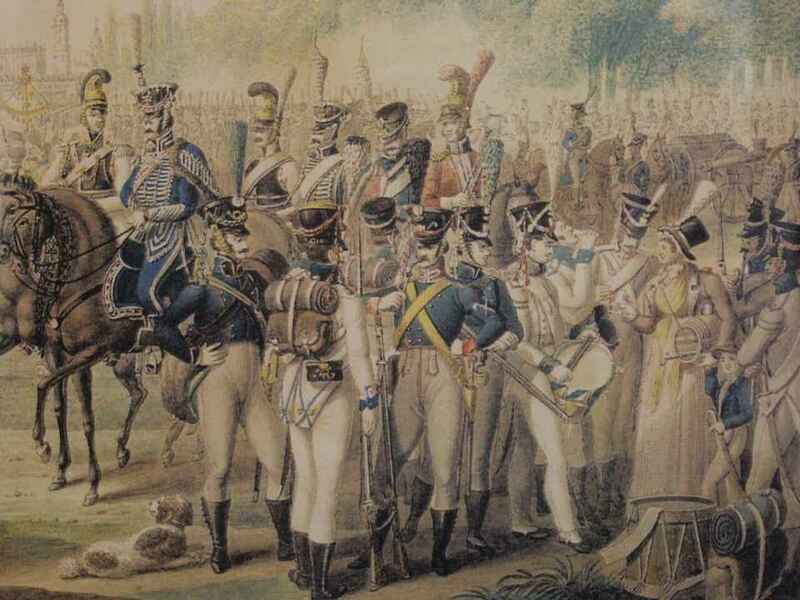 1863 Etienne-Jean Delécluze, French artist born on 20 February 1781. 1892 Bruno Schulz [–19 Nov 1942], Polish draftsman and writer. 1818 Alexis van Hamme, Belgian artist who died in 1875. 1764 Charles Thévenin, French artist who died on 21 February 1838.